An old school hauler with a modern feel! 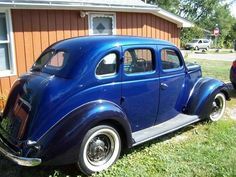 This 36 Ford Stake bed has an updated front clip with power disc brakes, power steering, a balanced and blue printed 350 V8, 350 Turbo automatic transmission, Vintage A/C, 12 Bolt differential with 3.03 ratio for effortless highway driving, class 3 tow package, heavy duty rear springs for towing, 24 gallon fuel tank, modern wiring, VDO gauges and comfortable upgraded interior. Put your business name on the door or park it out by the barn for functional yard art! California Cars is the place to go for the most exciting motor cars the world has to offer. We've been dealing in Porsches, muscle cars and classics since l984 and we also have a great service department, financing, and a complete line of sportscar accessories.